Is your company based in Crawley and you’ve discovered a business critical IT problem? Or have you damaged your computer or laptop and it needs to be repaired? There’s no need to worry, Woodstock IT are close by and ready to offer you whatever IT support you need. We believe that technology is about people so strive to make your life easier whether you need your tech for business or personal use. Providing you with many services from computer and laptop repairs to managed services, no job is too big or too small. Not only will you get the help you need, all support will be in real time to make sure everything is running smoothly. We’ll work with you no matter what solution you need. Woodstock IT have now assisted with the set up of 3 new offices for our business. Each time they have offered expert advice, competitive rates and a professional and friendly service. We would not hesitate to recommend Woodstock IT to any local business. We work all over Sussex and Surrey, including Horsham, Gatwick, Guildford, Pulborough, Henfield and more. Check out our other locations here. Crawley is a town with borough status in West Sussex, covering just under 18 square miles of land. It has been inhabited since the Stone Ages, becoming a centre for ironwork in Roman times. However, the opening of Gatwick Airport in the 1940’s caused a spiked industrial and commercial growth. 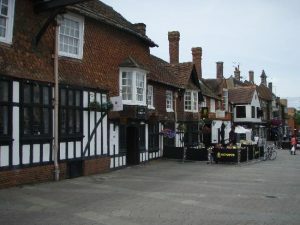 From restaurants to large businesses, Crawley has a large variety. it’s also smack in the middle of London and Brighton – an ideal location if you need to travel between the capital city and the coast. With so much commercial and industry work in the area, there is a high demand for IT solutions that work with you, not against you. Here at Woodstock IT, our aim is provide you with reliable IT support that does just that.